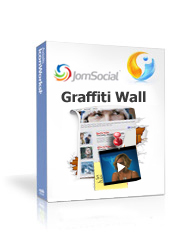 Graffiti Wall is a plugin for JoomSocial that will add an extended wall feature to the user’s profile page with graffiti, text, photo and video features. With this special graffiti application a user will be able to select the color, brush size, its opacity, add noise and draw whatever he wants on his, friends’ and other users’ walls. After the plugin is installed on the site a user will be able to add it in his Applications>Browse. Admin can make this a core default application in the backend. Then a user won’t have to add it. Powered by SEF support for Search Engine Optimization.